The two Kyiv Moishe House residents with whom the writer spoke said that they host a number of holiday events in Moishe House or at larger venues. They also sponsor lectures and discussions on such topics as the role of women in Jewish life, Jewish cooking, and Jewish practices in death and mourning. They have organized Jewish Kyiv excursions for young people. They hold frequent Shabbat dinners, usually followed by discussions; the average number of participants in Shabbat dinners is 14 to 16, said the young women, but once 20 people came. They believe that their role is to explore Judaism, not to teach Judaism. Most of their guests are secular, they said. They acknowledged their dependence on, and admiration for, Aryeh and Stephanie Pelcovits, a young American modern Orthodox couple volunteering in Kyiv for a year with the Jewish Service Corps. They have celebrated Shabbat and attended a Pesach seder at the Pelcovits apartment because they required a demonstration of how such observances should be conducted. One of the Moshe House residents told the writer that the primary appeal of Moishe House to her is that it provides comfortable living space in a safe neighborhood. Prior to moving into the Moishe House apartment, she had lived with her family in a smaller city near Kyiv and commuted to the Ukrainian capital daily by train. She enjoys some aspects of Jewish life, she said, but she believes that Israel is a “ghetto” and she has no interest in that country. 67. JAFARI (Jewish safari) is an organization that creates Jewish cultural and educational programs for the Kyiv Jewish population. Its primary event is a mobile Jewish scavenger hunt that operates every other week with a hiatus during the coldest winter months. Leaders Masha Putskova and Marina Lisak explained that five or more people participate as a team in a vehicle. The hunt begins several hours after the end of Shabbat and usually continues for four hours, although a separate version can be arranged for two hours. The late hours of competition, said the two women, assures that traffic will be relatively light. Up to 20 cars compete in each hunt, seven of them regularly and the others on an occasional basis. Most individuals are young adults, said Ms. Putskova and Ms. Lisak, but family groups also participate. Young couples with small children are welcome if the youngsters are seated in appropriate child seats. Participants pay a small entry fee to cover expenses. Information about the hunts is transmitted through social networking Internet sites and by word of mouth. Most competitions are structured around a specific theme, such as a particular Jewish historic figure or event. Participants are given a set of 10 envelopes to be opened in a numbered sequence; each envelope contains a clue, often written in a humorous or ironic style, about a specific building or monument related to the theme. Upon reaching the building or monument, participants call or text information to the organizers that verifies identification of the target. The organizer may ask for certain details about the site. Those responding correctly are authorized to open the next envelope and proceed in the search. Occasionally, said the two women, colleagues are posted at a specific site to check that the cars did indeed reach the intended target. At a certain time after midnight, all competitors gather at the Aroma café for coffee, a presentation on the significance of the theme that was being pursued that evening, and a summary of competition results. In response to a question, the two women said that police and many ordinary citizens are familiar with such urban safaris and are not troubled by groups of cars showing up at a specific site for a few minutes and then driving off to other sites. Ms. Putskova and Ms. Lisak also own a company called Купи слона (Buy an Elephant, a reference to well-known Russian children’s literature), which carries the tagline an agency of positive emotions. This firm creates and manages events for children, including parties, tours, and even Hebrew-language instruction. They have worked in Jewish schools and camps and also in city-wide Purim celebrations. They also have developed special Jewish safaris for particular organizations. Additionally, they lead Hebrew-language tours of Kyiv for visiting Israelis. Outside the Jewish communal infrastructure, they have created secular events for large international companies, such as McDonald’s and Procter & Gamble. Masha Putskova, left, was a philosophy major in university and now teaches Hebrew and is active in various aspects of Jewish culture. 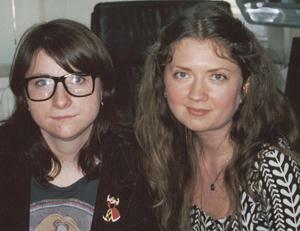 Marina Lisak, right, is an investment manager. The two women studied Hebrew in JAFI ulpans and now create and manage popular Jewish cultural events. 68. The Lo Tiskach Foundation – European Jewish Cemeteries Initiative was established in 2006 with the goal of gathering and organizing all known data on European Jewish burial grounds so that it is readily accessible to all interested individuals. A critical component of the program is engagement of young European Jews in this task so that they learn about the burial grounds and pre-Holocaust Jewish life and culture in surrounding communities. Lo Tishkach participants are expected to undertake practical work in the preservation and protection of these cemeteries and mass graves. Lo Tishkach was founded by the Conference on Jewish Material Claims against Germany and the Conference of European Rabbis. Its Ukraine representation was initiated in 2009 with financial support from the Genesis Philanthropic Group (Moscow) and both financial and logistical support from the Ukrainian Vaad (Association of Jewish Organizations of Ukraine). The writer met with Yana Yanover, coordinator of the Lo Tishkach Ukraine office, which is located within Vaad premises in Kyiv. Ms. Yanover said that the Lo Tishkach program in Ukraine expands upon work previously done under the supervision of Rabbi Yaakov Dov Bleich, Chief Rabi of Kyiv and Ukraine, and the United States Commission for Preservation of the American Heritage Abroad. In just its first year of operations in Ukraine, Lo Tishkach identified 10 previously unknown burial sites in the Kyiv region and another 35 in the Cherkassy region, Ms. Yanover said. Lo Tishkach expedition groups may be Hillel students, groups of other young people interested in history, or foreign Jewish young people desiring to explore historic Ukraine. Recruiting seminars, said Ms. Yanover, are held throughout the year in different Ukrainian cities. Recent seminars have been held, she continued, in Kyiv, the Carpathian Mountain area (known as Zakarpatiya or Transcarpathia), Liviv, Crimea, and Kharkiv. All relevant Jewish community groups are notified in advance of the seminar so that potentially interested students and young adults will attend. The goal is to recruit attendees to expeditions, preferably in their own regions so as to strengthen a sense of Jewish community and continuity. Participants are asked to propose their own projects within local areas, that is, decide which burial grounds to clean, whether to focus on monument development or fence construction, or other matters. Local rabbis are invited to explain all relevant Jewish laws regarding burials and related topics. Many expeditions are scheduled for university vacation periods in order encourage student participation. Information about Jewish burial sites and locations of mass slaughters during the Holocaust is published by Lo Tishkach in a series of books, such as the 106-page catalogue on Jewish burial grounds in the Kyiv region. 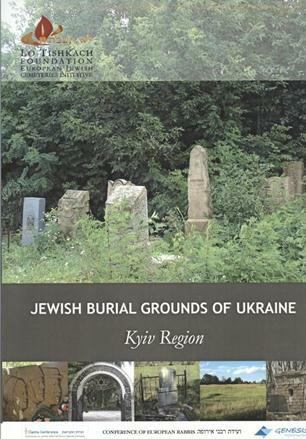 Similar volumes exist about Jewish burial grounds in other regions of Ukraine. The Jewish burial grounds depicted on the cover of the Kyiv region catalogue are (clockwise from top): Skvyra Jewish Cemetery II, Kyiv Jewish Cemetery IV (Kurenivske), Dymer Mass Grave, Borodianka Jewish Cemetery, Bila Tserkva Jewish Cemetery II (Kyivska), and Makariv Mass Grave (memorial monument). The young woman in question was raised in a city south of Kyiv in which Bundism retains some adherents. Aroma café in Kyiv is one of a number of international cafés modeled on, and owned by, the popular Aroma cafés in Israel. Lo Tishkach (Heb., לא תשכח) is translated as Do not Forget. In addition to creating a data base of all European Jewish burial grounds, information is gathered about local laws and practices affecting their protection and preservation. Data thus assembled facilitates advocacy for maintenance of these sites. The headquarters of Lo Tishkach are located in Brussels. See their website at www.lo-tishkach.org. See pages 114-116 for further information about the Vaad.